For many decades entomologists studied insects in laboratories to understand everything about them. At some point over the course of the 20th Century, they reached a new level of understanding when they studied how individual species contributed towards a much larger eco system. Take ants for example. Ants not only grow and harvest their own food, they also safely handle material waste (including waste from other species), create their own medicines and disinfectants; in addition to constructing their own living environments from recycled material. They do all this, whilst maintaining soil and nurturing the eco system that they inhabit. What If we could effectively design our own environments so that they matched the efficiency of the natural world? This arguably is the big challenge for design over the next fifty years. If we could understand architecture as separate from artistic branding or as objects alone, then I am certain that in fifty years no one will ask about iconic buildings; the focus of the future will be upon how to globally manage and distribute constrained resources. The design debate shouldn’t be as Bruce Mau states, “the world of design”, but rather, “the design of the world”. The confluence of technological advancement as a social facilitator, combined with our advanced scientific knowledge has presented us with a unique opportunity as designers to make positive change. We live within a social, political and educational system geared towards a flawed model of scarcity; design in its current incarnation serves the economic climate. It is time we understood that the profession is much greater than what we are currently achieving as a collective. If you don’t believe me, look at your current paycheck. What if architects applied their lateral thinking beyond buildings as objects in themselves? The built environment is merely one part of a much, much larger system. A genuine and large-scale environmental agenda is not foreseen in our profession. If we want to justify our value as lateral thinkers, then it’s not just about breaking the rules. It’s time to play a different game altogether. The Darwinist view in business is survival of the fittest. I argue otherwise: it’s about who can adapt the quickest to the rapidly changing world around us. If you want to compete in the 4x400m race of economics, good luck to you; but if you want to run the marathon (because the problems facing the world won’t be solved quickly), then keep reading. Developed society has a glut of information; we’re now producing millions of terrabytes of information on a yearly basis. However, we are missing applied knowledge; this is where the idea of synthesis becomes useful for designers. Synthesising the ideas and groundbreaking research into architectural projects is completely feasible, it creates possibilities – and with it – innovation, that so far only few have grasped. New Scientist, WIRED and Websites such as TED.com are not only engaging the scientific community with designers, who can string different bits of compartmentalized knowledge together in a meaningful way, but actually the idea of simply sharing ideas is endemic of a much wider societal trend; that of the economics of abundance. And abundance, according to authors from Chris Anderson and Yochai Benkler, is the new currency. Think of the possibilities for synthesised lateral thinking: want to remediate land for a project? Why not speak to some mycologists (Mushroom scientists for the rest of us). As Paul Stamets demonstrates, applying these principles in the built environment can go a long way to get kudos with your clients and the world. I have no idea why we’ve conceived of these areas as two separate fields. As boring as highway design may be to the masses, it has to be acknowledged that cities cannot function without vast logistical behemoth that sustains them. As this entry into the 4th International Architectural Biennale in Rotterdam demonstrates, the urban condition must acknowledge the much larger (man made) eco system that feeds it. Produced by the Interdependence Day Project and the School of Architecture, University of Sheffield in conjunction with the New Economics Foundation and Open University. Think about that for a minute. Did anyone ever consider that the humble electricity pylon just might be the most successful piece of industrial design of the 20th century? It’s simply constructed and is structurally efficient, carries the lifeblood of modern society; and for something that’s 25 odd metres high is invisible to the general public? There have been some amazing architectural projects based around this premise. In 1967 Cedric Price conceived of a completely new mode of higher education, utilising and strengthening energy and transport infrastructures to revitalizing a declining industry in his home county. As far as synthesising ideas from different fields, and using infrastructure to combine these into a singular vision for education and industry; Potteries Thinkbelt still remains one of architecture’s great unrealised projects. And we’re seeing renewed interest in infrastructure. The Obama Administration is placing a great deal of money and effort into redeveloping America’s transport and energy infrastructure’s to meet the needs of tomorrow. If there was ever a time for design graduates to get into designing infrastructures, this is probably it. The relationship between design and infrastructure is one being explored by a new wave of architectural practices. InfraNet Lab for example, regularly posts projects that considers infrastructure as architecture(s) in itself – ranging from historical examples to cutting edge graduate work. Alastair Parvin’s SERVER considers a well used section of the UK’s M1 and realises it as a closed loop ecosystem. Perhaps we should see the way things are as a catalyst to move towards the way things could be. Again, this may seem obvious but lack of funds and the rise of social networking is the perfect excuse for designers to re-engage with community projects. And I don’t mean community projects where something necessarily gets built. In the vein of synthesis and infrastructures, it’s time we engaged with communities in enhancing their experience of neighbourhoods in one way or another. In the UK for example, the food agenda has entered the public debate; where it comes from, who is producing it. Allotment waiting lists are now longer than they have ever been. I’d say it’s a pretty good time to be a designer if you can somehow get involved with local neighbourhood groups concerned with growing. Grow Sheffield is one such group, created in 2007 by an environmental artist and her friends. One of their more successful projects, Abundance, has a very simple premise: pick, sort and redistribute Sheffield’s fruit from its private and public trees for free. Therefore Sheffield’s seasonal excess doesn’t get wasted and raises awareness of the food agenda. After being screened as a segment on Channel 4’s River Cottage, interest in the Abundance project is spiralling on a national scale. Capitalising on this, here is where two design projects could help broaden their appeal further. The first was to help the group put together an organiser’s handbook based on their experience, thus opening up the potential for Abundance projects in other cities. The second was to create a network that went beyond just picking apples from a tree. The premise was as simple as the Abundance project: create an easy to use database of sustainable food sources for people in Sheffield. It took ten architecture students six weeks to develop the idea with further research and public consultation. The end result is a reprogrammed Google Maps interface managed by Grow Sheffield called the Sheffield Food Network. Not architectural enough for some of you? Projects like this are essentially designing infrastructures, though online as opposed to physical. It should be noted that projects like these are exciting because they plug into something much bigger and work together to a much greater goal. They are infinitely scalable and cost relatively little to maintain. What is being achieved with projects like these is challenging the food distribution system as it operates under the economics of scarcity; and proposes a food system that operates within a system of abundance. This is nothing new; the Cubans have been doing it for years with their organoponicas gardens – a staple part of Havana’s unique urban infrastructure. However, the very idea that it is possible to reverse our dependence upon vastly complex food distribution systems paves the way for some very interesting community led projects. The Urban Pantry is one such example of how this may work. Just like the other projects, it has a very simple premise: a food orientated community centre that engages residents within a ten minute walking distance. Jordan J. Lloyd. 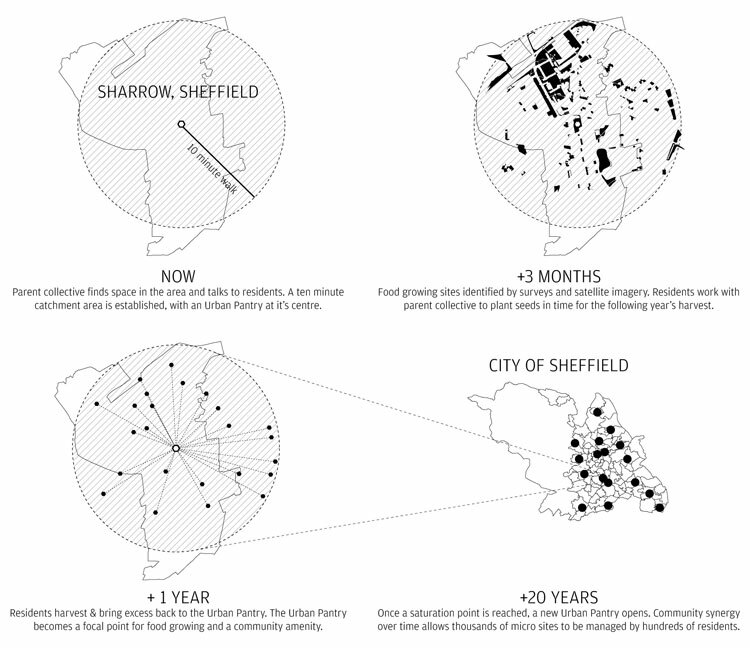 Research project undertaken at the School of Architecture, University of Sheffield. Someone like Grow Sheffield can use it as a base of operations, engaging local residents into turning leftover land into small plots and encourage small scale growing programmes, with an Urban Pantry as a storage facility/information point/community café. The success of the pantry lies in its inherent synergy. Several or hundreds of pantries work together to manage localised growing schemes. Food is only the first step. Such thinking can be applied to waste, energy or land remediation strategies all over the world. Thinking about how several projects can contribute to something much larger without necessarily building anything can serve the public interest and utilise the best bits of your creativity. Anyone who says that architects should just produce buildings is remarkably short sighted. It never stopped Da Vinci from designing fortresses for the Sforza’s. He understood that applying his creative genius to all manner of problems in science and the arts would further human understanding on a global scale; therefore shouldn’t we do the same? Jordan J. Lloyd is a recently graduated masters student in architecture, rocks out to Motorhead in the shower and is in the process of turning something he says into something he does. Go see him in 20 years if you think he’s wrong! ‘Completely relevant but not necessarily architectural reading list’. Im not an architect but i really enjoyed reading this article. It is a great insight into the potentially narrow-minded profession. Really appreciate that this goes beyond regular conceptions of form making and does not understand architecture as an isolated building.